Having your car stolen is awful. Just awful. But, as I learned not long ago, it's not entirely hopeless. I did get (most) of my stolen car back, and I learned a great deal in the entire process. So, in hopes of giving a little bit of that goodness back, here's what I took away from the experience of recovering a stolen car. I am, of course, aware that as a writer for a popular automotive website, I had a huge advantage over most people stuck in this unenviable position. I had a very large megaphone with which I could complain and cry and plead for help, and that was absolutely crucial. But those of you out there with you know, real jobs can still take advantage of most of the same things I did, and hopefully will have equally positive results. 1. Call the cops, do everything by the book, but don't rely on the police to find your car. First, I just want to make it clear that the LAPD was very friendly and helpful in the entire process. Also, thanks to some connections I've made in the course of my job, I got a bit better attention than I think most folks would. But that still didn't change the fact that the police weren't the ones to find my car. Police departments, especially ones in large cities like LA, really have better things to do with their time than find all the stolen cars. They just aren't equipped to give everyone the attention they deserve. And, while that can be infuriating, it is what it is. So while you need to report the theft and involve the police from the start, the responsibility for locating your car is really your own. I see that you recovered your vehicle. It sounded like you had the help of the "community." That is they way it is supposed to be. People see something going on, they take action. At least they call the cops and are good wits. Further, they help out where they can. The police like it when communities act like ours did a few weeks back. People looking out for one another is probably the best way to stop crime, and it sure as hell helped me. So, involve the cops, keep them updated, but you need to be your own detective. The reason I got my car back was because I made a big deal about it. I talked about it every chance I could, and, even more importantly, threw as many pictures of it online as possible. I really, really wanted it back, and so I didn't shut my big yapper about it. You should do the same. Get the word (and pictures) out about your car everywhere you can — car forums, local neighborhood websites, Craigslist, everywhere. Send your pleas to me, as well! I feel like I owe a karmic debt to the general car-community for all their help, so I'll try and get stolen car notices on Jalopnik as much as I can. We probably can't do every one ever, but I'll do my best. The key here is to get as many people in the area where your car may be thinking about your car at least somewhere back in their brains, so if that car gets spotted, something is triggered and they'll be able to let you know. So they need to know what it is and what it looks like. Take pictures. In fact, go take lots of pictures of your car right now, just in case. Well, wash it first. Make sure you have an easy path for people to get ahold of you as well — email, phone, whatever. You may end up giving up some of your normal privacy levels in this process (I posted my phone number in the comments, like a desperate madman) but it could be the difference between someone getting ahold of you or not. 3. Get as many real eyes on the roads looking for your car as you can. In theory, the cops will be looking, but more often than not they're going to have much bigger, tastier fish to fry. You need a small army of eyeballs roaming the streets looking for your car. So, find the people who roam the streets. I went to all the municipal tow companies that service my area of LA. I gave my car's picture to the dispatcher and passed out flyers to the drivers as well. I offered a small but decent monetary reward to the driver and dispatcher on duty who found the car, and made sure the dispatcher had my number to call me if it was seen. They were all very receptive and helpful, and the dispatcher of one company was a former Beetle owner himself, so he was especially enthusiastic about helping out. People are generally very good about this. Also, you'll want to get in good with the local tow yards in case your abandoned car ends up in them. They'll be more likely to call you when they find it if they already have a relationship with you, and that could save you a lot of money in storage fees. There's lots of options for this aside from tow companies — try cab companies, pizza or other food delivery companies, postal carriers — anyone whose job involves lots of driving around. The more eyes around, the more chances of your car being seen. 4. Don't forget about the robot eyes! 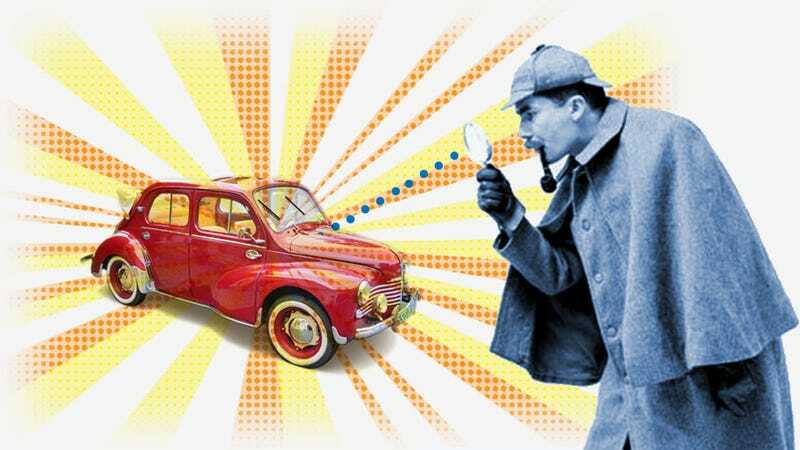 We live in a surprisingly well-surveilled society, and while there's all kinds of issues associated with that, it could help you recover your car. One of the first things I did was to check my neighborhood for cameras. I have an elementary school right across from my house, and they'd be in a perfect position to have recorded the actual act of snake-in-the-grass thievery itself. Sadly, crappy education budgets meant they had no cameras, but still, you may be luckier than me. Check every building around your area for cameras. Most businesses will have them — gas stations, grocery stores, small shops, pretty much anything. I did find one grocery store that had street-facing cameras on what I learned was the route where my car was taken, and they were willing to let me review the footage. Luckily, my car was found before I had to do that, but you get the idea. The key here is you should act quickly on this one, because many security camera systems re-record their footage on short cycles— sometimes daily. So, find the cameras and ask for the footage to be saved, if possible, as soon as you can after you find your car stolen. What you find in the footage may or may not help recover the car, but any information helps. This was one of the most popular suggestions, and one of the things people were very good about helping out with. If your car has been parted out, finding who's selling those parts could be what leads you back to your wheeled baby. Of course, distinctive parts are easier to spot, and are also possibly less likely to be publicly offered for sale as a result. But sometimes the thieves aren't aware of what they have, or just aren't that bright. So it's worth checking. Using automated checking systems, like this on-the-hour Craigslist checker, can help take care of this process for you. If you're able to identify parts from your car, make sure you contact police before arranging any meeting with the seller. The police can and should accompany you in these situations, and they have experience doing this safely and discreetly. Remember, these are car-stealing bastards you're dealing with. They're could be dangerous, and at the very least they're probably ugly and smell bad. I absolutely understand how much a car can mean personally to someone. We all know these aren't like other machines in our lives, so if the car had that kind of value to you, be ready to put in the effort and time to find it. It may not happen, true, but it's a lot more likely to be found if you and a supportive community are involved. So, it's all about us, in deference to the Detective's kids, giving a poo. And I think we do that very well.